The results of our rain- and showerproof test are in! Using unique and patented technology, TUBEX have developed the Vinewrap Peg-thru to provide an effective vineguard that is both easy to open, and which is also designed to stay open whilst essential maintenance operations are carried out on the young vine plant. TUBEX Vinewrap Peg-thru requires the use of a 3mm steel securing rod, which acts as the vine ‘tutor’ (training the plant up to the first trellis wire) and which can be re-used multiple times. TUBEX Pegthru simply slides up and down the rod, hinging open on the specially designed rod cavity and springing back into place when released. Spreading snail pellets without due consideration is like throwing cash on the ground. Take some time and mull over the following points – it will save you money. Use the correct snail pellet – for instance Sluggem, Sluggem Prima or Sluggem Mix. 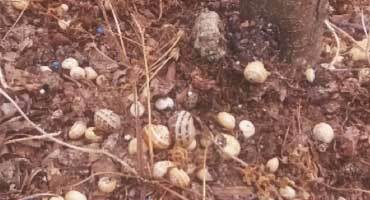 The type of snail pellet is determined by the age and type of the snails or slugs. The species of slug or snail also plays a role. Do you need Sluggem, Slugger or Sluggit? You do not necessarily need a snail pellet with a double active. Know your species. Where you have micro irrigators in place, use the Prima snail pellets (rainproof up to 21 days) for longer lasting protection. Orchard Agrikem is a leading South African manufacturer of snail bait pellets and supplementary agricultural chemicals. Established in 1922, we have always been at the forefront of product development continually searching for new approaches to provide our customers with better quality snail bait pellets and agrochemical products at competitive prices. One of these innovations is our SlugPro Programme, an extended snail monitoring programme to assist farmers in controlling their snail and slug infestations. Orchard Agrikem also provides a turn-key solution for customers in search of product blending, pelleting or repacking solutions. With our blending plant, we are able to blend up to 2.5 tons of dry powder products and 500 liters of liquid products per hour. Our decades of manufacturing experience makes us the competent supplier you've been looking for. We have two complete pelleting lines capable of producing up to six tons of pellets per hour. Orchard Agrikem has extensive experience in a wide range of products, both on pellet size and material to be pelletized. For high quality pellets, look no further. If you import, export, manufacture or distribute agrochemical products that require repacking or relabelling, we are able to reduce your bulk liquid or dry agrochemicals into smaller units. Whether it is a short or a long run, once off or recurring, request a detailed quote from us today. We toll formulate and export to your specification using only the highest quality raw materials. Should you have existing molluscicide products that you would like to develop or outsource manufacturing for, you need to speak to us. Our existing production volumes and buying power allows us to manufacture highly competitive for the global molluscicide market.